Touch was as popular at CES 2013 as ever before. Wandering the floor of the South Hall where most hardware companies set up shop, we ran into a slew of touch tables, touch displays, and touch PCs – though few appeared to be anything strikingly new. However, one company named MultiTouch stood out from the crowd. Other companies no doubt envy MultiTouch for having the foresight to capture such a recognizable moniker, but the company’s name is more than just hype – it’s also its killer feature. 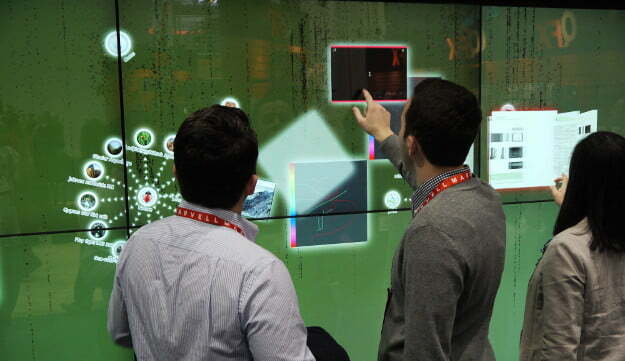 Unlike most touchscreens that can only handle 10-point touch, the company’s displays allow for unlimited touch points. Yes, that’s right; unlimited, as in infinite. 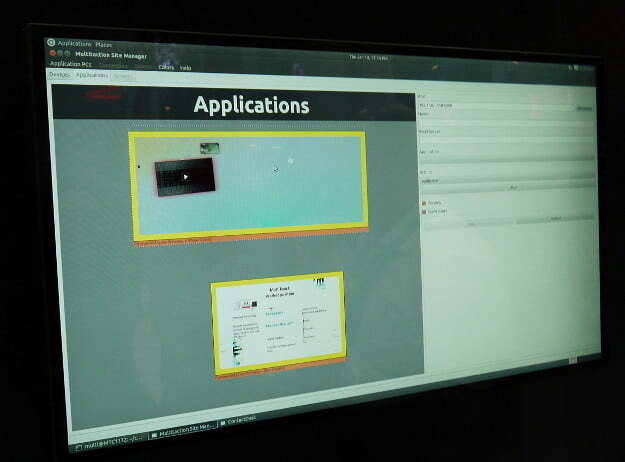 We had the chance to take a look at the technology at MultiTouch’s booth, which featured a large wall made up of six separate 55-inch MultiTaction touchscreen displays. A multitude of enraptured onlookers attacked it with swipes, waggles, and prods; and no matter the number of people with hands on the screen, each poke was promptly detected. Rather than using capacitive touch, which is found in smartphones and computers, MultiTaction relies on optical technology. It shoots infrared light through the display panel and looks for reflections. The intensity of reflected light can tell the display if someone – or something – is touching it. MultiTaction can detect human hands and inanimate objects with equal ease. It can even detect high-contrast details printed on an object. 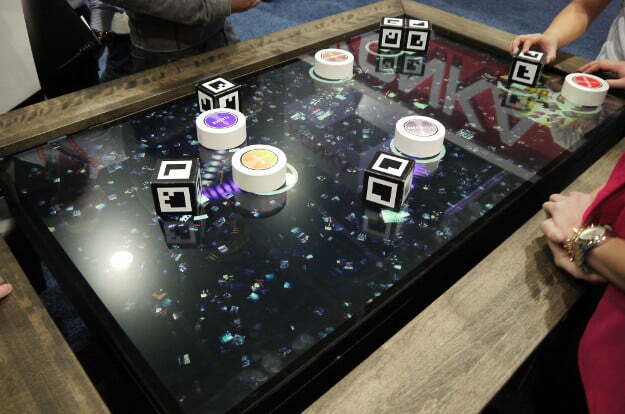 MultiTouch demonstrated this with blocks slapped with black-and-white diagrams that could be used to modify sound. The blocks let users turn sound effects on or off by placing them on or removing them from the display, which detected these objects accurately and instantly. It could even detect when an object was rotated on the display’s surface. All of this movement can be tracked with a custom backend that lets the owner of the displays see how they’re being used in real-time. This could be useful for store owners wanting to see what products their shoppers are interested in, as well in the educational sector, to be able to monitor how students are interacting with the display. Though impressive, MultiTaction isn’t perfect. The technology requires that the displays be about eight inches thick, which is quite fat considering some of the super slim all-in-ones we’ve recently seen. Besides that, it doesn’t work properly in an extremely bright environment. Indoor lighting is fine, however. The other major downfall is that these high-tech displays don’t come cheap. You’ll have to pay $22,450 for the 55-inch model. That’s a lot of dough, but the high price is acceptable and even expected since MultiTaction is not a consumer product. It’s built for businesses, schools, museums, and other large organizations that may want to create a unique touch-sensitive display unlike anything possible with off-the-shelf technology. And while it might be a while before we’re able to buy an affordable MultiTouch display, we can still dream. We hope technology like this might one day turn a research project like Microsoft’s Holodeck into a device we can enjoy at home.